Wayne Gretzky's marketing appeal sky rocketed to new heights when he landed in Los Angeles. All Pat Brisson needs to do is listen to his young and impressionable clients. Brisson, a registered NHL agent, started in the business of representing hockey players when Wayne Gretzky was still building his legacy, but the talented youngsters in his Rolodex today let him know how that legacy still endures. "When I talk to Jonathan Toews or Patrick Kane or Sidney Crosby, all these young players, Wayne always comes up in the conversation with the way he set the bar," Brisson said. "He comes up in many conversations in how to play the role." Gretzky originated the role of marketing machine for hockey players. Many believe the impression he left for today's stars is immeasurable, which adds to his legacy but greatly decreases the odds for a Gretzky sequel. "There always needs to be somebody that the League can use to market itself and I can't remember the last time the League had as many great young players as it does right now," former teammate Mark Messier said. "To say there will ever be another Wayne — I don't think so. Wayne set some pretty lofty standards, not only on the ice, but the way he conducted himself off the ice, too." Gretzky's legend began in Brantford, Ontario, where he learned the game by practicing on a backyard rink built by his dad, Walter. His marketing appeal grew along with his legend in Edmonton, where he won eight straight Hart trophies as League MVP while captaining the dynastic Oilers of the 1980s. "He was the North American spokesman for Canon cameras," said Mike Barnett, Gretzky's former agent, who now works in the New York Rangers' front office. "He had the biggest billboard in Times Square when he was still an Edmonton Oiler." Gretzky's legend and marketing appeal soared to previously unimaginable heights for a hockey player when he was traded to the Los Angeles Kings on Aug. 9, 1988. The arrival in Hollywood of the game's biggest attraction wound up as a marketing bonanza for the NHL, which subsequently expanded into the Sun Belt during the next decade. Gretzky became the centerpiece for numerous national and international marketing campaigns. "He had already transcended his sport when he arrived in Los Angeles," Barnett said. "When the trade was announced, they cut into the daily soap shows to announce it. It was real big news. He was already established as an athlete who embodied all the things that a corporation would want in a spokesman. He perpetually was at the top of his sport in performance. He stayed healthy. He carried himself away from the rink as an ambassador. He didn't shy away from his responsibilities in that role. He was approachable." Gretzky starred in the ads launching Sharp's first video camera. He was a spokesman for Coca-Cola for many years. He forged a relationship with Ford that still lasts today, nearly a decade after he played his last game. He starred in Super Bowl ads and hosted Saturday Night Live. He helped develop and used his voice to star in ProStars, a Saturday morning cartoon that ran on NBC for 13 episodes in the early 1990s. ProStars also featured Michael Jordan and Bo Jackson. Gretzky appeared in numerous print ads for American Express. Campbell's Soup used an image of Gretzky on its label, making him the first human to appear on a can. It was groundbreaking in more ways than one. "We were ahead of the curve in that we convinced Campbell's to permit a small byline under his image, www.gretzky.com, to give awareness of the new Web site we were creating," Barnett said. "The number of impressions that came back far exceeded our capabilities to do anything with it in those early stages of the Internet. It was just really an information site then." Today, Gretzky's Web site promotes everything related to No. 99, from the Phoenix Coyotes to his business partners, his foundation, his Toronto-based restaurant, his winery, Gretzky-related merchandise and more. "He set the benchmark, not only for hockey players but for high-profile athletes," said Albert Hall of Hallpass Media in Irvine, Calif., which represents Alex Ovechkin's off-ice endeavors. "Wayne Gretzky was as high-profile as anybody. He had the look, savvy, the Hollywood wife, the whole thing. Gretzky was a pioneer." Gretzky so fluidly crossed over to the mainstream by combining his incredible on-ice accomplishments with an approachable personality that made him marketable to people in all walks of life. "He just had a way about him," Washington Capitals owner Ted Leonsis said. "He was such an ambassador for the game. People saw themselves in Wayne. He was either the son you wanted to have or the brother you wanted to have. He just seemed so normal and approachable and sweet, and yet he was otherworldly on the ice. That's a rare, rare combination." Gretzky passed the torch as the NHL's national and international spokesman onto Pittsburgh Penguins' superstar Sidney Crosby. 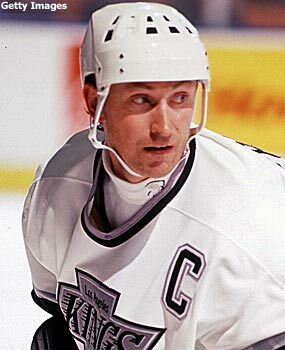 Messier recalled Gretzky being tireless in his marketing endeavors even before the trade to Los Angeles. "We would come back from a two-week road trip east, and one day later he slides back out to do a commercial to promote the game," Messier said. "It was an endless amount of energy that he put forward and he did it so easily and eloquently. He really has set the model of what the players need to be." Most notably for Crosby, who, right or wrong, has been ordained as the League's national and international spokesman at just 20 years of age. Crosby is certainly doing his part. He has marketing deals in place with Gatorade and Reebok — with "more to come," Brisson said. He has already taken his team to the brink of a Stanley Cup championship and he's not even legally allowed to drink from the trophy. But Brisson bristles when people say Crosby is the next Gretzky. "He's got some Gretzky in him," Crosby's rep said. "He's got the ability to be a superstar at such a young age and manage it so well. It's a gift, a special chip. You have it or you don't. Now, to say that is he the next one, well Sidney Crosby is going to be Sidney Crosby. Ten to 15 years from now, people are going to look at the next kid and ask, 'Is this kid the next Crosby?' Sidney will pave his way in a different form than Wayne, but in my opinion he has so far been a unique athlete like Wayne." Crosby, Ovechkin, Kane, Toews and even John Tavares, the consensus No. 1 pick in the 2009 Entry Draft who Brisson also represents, have an advantage today that Gretzky was never afforded: They are coming up in the age of the Internet, which only enhances their exposure and marketing opportunities. "When the blue-chip opportunities were coming on a weekly basis for Wayne, he already accomplished the unfathomable," Barnett said, "and that's winning nine Hart trophies, seven scoring championships consecutively, and four Stanley Cups." Both Brisson and Leonsis said that if Gretzky played in the age of the Internet, he wouldn't have had a leg up on any of the today's stars just because of his stats and championships. The information highway is so long and so wide that there is room for everybody — it doesn't matter how many trophies you have sitting at home. "There will only be one Wayne Gretzky, but the Internet has made Alex Ovechkin accessible everywhere," Leonsis said. "When he scored the goal in his rookie year we had over a million hits of the goal on our Web site and about 600,000 were from outside North America. It was a global phenomenon. If we had broadband Internet when Gretzky was playing he would have been the same way." Yet, even without the Internet-savvy fans and marketers at his disposal, Gretzky set the model that players try to follow today. He just did it through his play and his personality, which is reason enough for experts to believe No. 99 is one of a kind. "Lots of people didn't know about hockey, but they knew this Gretzky guy," Brisson said. "It was an era when information was traveling slower, but he still managed to be the name of the game."